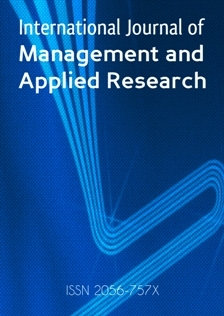 The International Journal of Management and Applied Research (IJMAR) is a peer-reviewed open access journal welcoming the submission of research papers reporting on applied research in business, management and entrepreneurship in international contexts. IJMAR publishes a broad spectrum of articles contributing to the latest business and management theory and practice. The journal aims at a quite efficient turnaround in the reviewing process. The editor’s response takes up to two days, while the blind review by two independent reviewers takes up to two weeks. Examples of topics which illustrate the scope of the journal are provided below.